PLEASE IGNORE THE BUY IT NOW PRICE!! It’s time to make space! Mannbuck Steel Ltd have been providing new, used and recycled steel to to all manner of customers, from sole owners of the smallest business to multinational corporations for over 40 years. In recent years with the increasing use of inland waterways for both leisure and residential use, supplying ballast to boat owners has become a larger part of our or business. We’ve set up Boatballast.UK in order for new clients and returning customers to be able to utilize an online hub of information for all their trimming and ballasting needs. Whether you’re a boat owner who chugs down the cut a couple of times a year for a relaxing break, a residential owner enjoying the exciting life living on the canal or a narrow boat enthusiast living the dream, you’ll know how vital space is aboard your vessel. Whilst brick and concrete blocks can provide ballast, our steel blocks are a whopping 331% heavier than their brick equivalent! And that saves alot of space. huge amounts of valuable space compared to either brick or concrete. sizes or cut to your specific requirements. 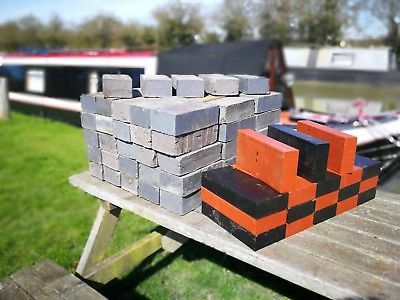 This Ballast For Narrow Boats & All Watercraft (solid Steel) boat is located in West Midlands, DY84LS and is being sold on eBay by mannandbuck.